The Chicago Auto Show is back and taking place at the McCormick Place until Sunday, February 19th. On Wednesday, February 8th General Motors made Product Marketing Manager Harlan Charles, Camaro Lead Designer Joe Baker and Global Marketing Director Russ Clark available to answer questions. They each explained in detail how they keep consumers in mind as they execute their day-to-day activities. Some of the favorite General Motors 2013 vehicle display models include: GMC Acadia, GM Code 130R concept car, Chevrolet Camaro ZL1 Convertible and Chevrolet 2013 Corvette 427 Convertible Collector Edition. 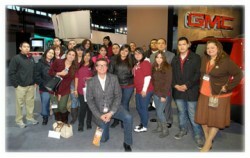 On Thursday February 9th, General Motors and GMC hosted a luncheon for a group of students from Latino Youth High School. General Motors Communications Manager Nina Price, GMC Color and Trim Designer Johanna Medina and Director of Diversity Initiatives Alma L. Guajardo-Crossley addressed questions from the students and offered tips on scholarships and jobs. The students also enjoyed a tour of the auto show and Medina explained how she executed the creative design process for the 2013 GMC Acadia. Throughout the day, the students received gifts for answering random questions and for participating on simple social media tasks. Alexia Calderon, a Latino Youth High School senior, was the lucky winner of two tickets to the upcoming United States Hispanic Leadership Institute Conference which will take place at the Sheraton Hotel on February 16-19th. Calderon and her guest will be General Motors’ special guests to this event. Yanely Castillo, also a senior at Latino Youth High School, said she will be graduating this summer and now plans to go to college and study automotive technology and design. When asked what she learned during the presentation, Castillo said, “I was motivated because, she (Medina) is a woman and I see her as a big success in life. Johanna showed me that with a lot of hard work, dedication and if I keep following my dreams, I can actually be what I want to be in my life,” said Castillo. Guajardo-Crossley mentioned the many ways in which General Motors supports various Hispanic organizations such as: League of United Latin American Citizens, United States Hispanic Leadership Institute, National Council of La Raza, National Association of Hispanic Publications and Hispanic Association of Colleges and Universities, just to name a few.